Best Pedestrian Route (BPR) occupies and resonates within this threshold through multiple scales and meanings: a slanted and skewed temporary walkway, its cantilevered form is not only expressive of the volatility of its location, but is also, by design, able to systemically respond to the inherent instability created by the ongoing construction in Lower Manhattan. 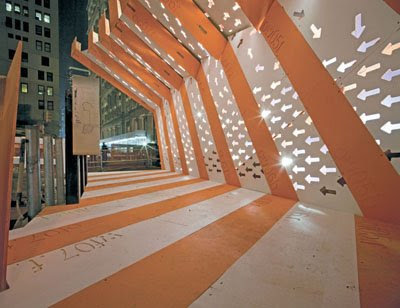 BPR is conceived as a system of walkways, this being the first of several variations planned throughout Lower Manhattan, allowing visitors to shift their attention from the disruption of construction to a projected future downtown. Inspired by the graphic symbols of construction sites and the instability of spatial and temporal boundaries of these zones, this temporary pedestrian walkway blends in with its surroundings. The appearance of instability is produced by its cantilevered and slanted form, which challenges visitors to question the definitions of construction and architecture, process and completion, temporary and permanent. As a prototype for a new kind of construction barrier, information modelling logistics are tested through the flexibility embedded in BPR’s modular and parametric design, allowing this iteration to be the first of those planned. 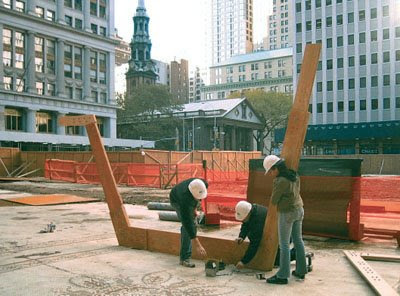 The fabrication and assembly sequence of Best Pedestrian Route began with the CNC-milling of marine-grade plywood parts in the FABLAB of the School of Architecture at the New Jersey Institute of Technology. Three specific types of tool-paths were utilised. First, subtractive holing was coded with a 5⁄16-inch diameter drill bit to create holes where the various plywood structural parts that form the ribs were to be bolted together. The 20-millimetre (0.75-inch) plywood sheets were bolted in thicknesses of 37.5 millimetres/1.5 inches (two sheets) or 75 millimetres/3 inches (four sheets) depending on moment stress along the length of the ribs themselves. To further strengthen these assemblies, pocket cuts removed material from the rib components for the addition of aluminium gusset plates sandwiched between sheets. All parts, including the gussets, sheathing and cladding for BPR, were then profile cut from 4 x 8 plywood sheets to their final, optimised shapes for assembly. Tool-paths are generated virtually and transferred to a CNC machine for cutting or forming. They are contained in ASCII text files known as G or M codes. G-Code is a functioning code that lists the tasks to perform the actual cutting or forming of materials, while MCode, or machining code, tells the machine to start, stop, provide coolant and so on. 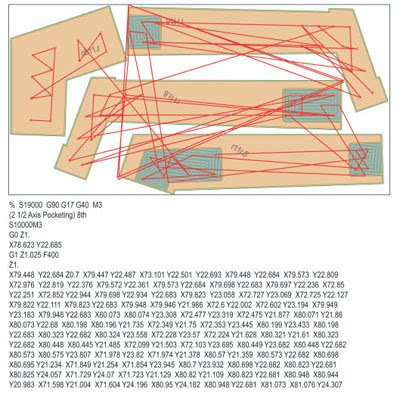 Shown here is a sample of the code generated to cut the pictured rib pieces. The function S sets the spindle speed of the cutting tool, G0 directs the tool to rapidly move to the first position of the path, and G1 is linear interpolation, in which the machine finds an X–Y axis of the curves it is about to cut. For BPR, three methods of cutting were used: first, subtractive holing, or drilling (G81) to bore holes for bolting; next pocket cutting to accept aluminium gussets at areas of high bending moment; and finally profiling to precisely cut the final shape of ribs (both G90, G17, G40 functions). The X, Y and Z coordinates plot the path of each part. Illuminated at night, the cladding of this temporary pedestrian walkway emits light through arrow-shaped apertures that recall the graphic symbols of construction signs while maintaining the structural integrity of the panels by acting as a diaphragm between ribs. The dynamic flow pattern of the arrows plays on the experience of disorientation created by the extensive construction zone in Lower Manhattan. This zone encompasses more than 80 individual sites and work is expected to be in progress until at least 2012, giving the usually temporary environment of construction a permanence that requires thoughtful design consideration. The illuminated school of arrows which flow across the cladding panels was generated by plotting a scripted series of points across the length of the iconic orange and white sheathing. 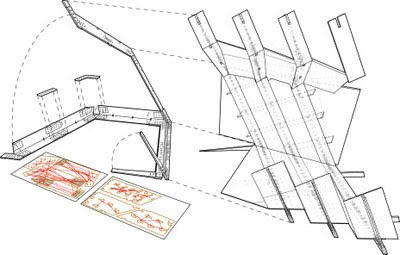 BPR was designed with a roof cantilever ranging from 1.5 to 3.3 metres (5 to 11 feet), and the sheathing between the cantilevered ribs in the walkway’s roof needed to resist lateral wind loading and prevent sideways movement of the cantilever. To achieve this while maintaining the school of arrows, individual cut-outs were constrained so that they would be separated by a minimum radius of 5 centimetres (2 inches), thus maintaining lateral stability in each roof panel. 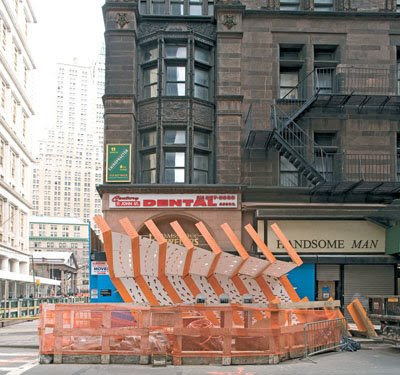 The eight marine-grade plywood ribs that form the structure and geometry of Best Pedestrian Route were assembled in the construction staging area of the future Fulton Street Transit Hub adjacent to the Corbin Building in Lower Manhattan. Here, New Jersey Institute of Technology (NJIT) students Justin Foster and Ninett Moussa work with NJIT assistant professor and founder of GRO Architects Richard Garber to tighten the bolts that secure the multiple layers of plywood, glue and pocketed aluminium gussets.